1995-present: Member of Research and Development Team for "Post Rehabilitation Fitness"
Specializing in integrating and balancing Your Physical, Mental, and Spiritual Well being. 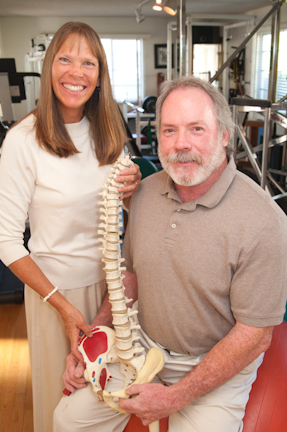 Dr. D'Ann Lawson has been a Chiropractor for over 26 years in Santa Barbara. Her speciality is spending time with each patient in a careful and comfortable manner to diagnose and treat each symptom. Each treatment consists of massage and other modalities to relax the body and get it ready for either a traditional chiropractic adjustment or a non-force technique. Her office enviornment is casual and family friendly, adding to the warmth of her treatments. A typical session lasts 30 minutes. Dr. Lawson believes exercise should fit easily into your daily life and that exercise should be done with a Smile, Laughter, and Enthusiasm. In this light she teaches classes or does individual sessions to find out what works Best for YOU. Her belief is that a good Stretching program is the most important part of any exercise routine and that cardio and strength training are secondary. It is important to remember that stretching keeps the joints and muscles open and flexible thereby allowing blood and lymph to circulate to every cell in your body and to create healing. Dr. Lawson has completed a course called Restorative Exercise which she teaches several times a week that incorporates realignment of the bodies joint and soft tissue markers to decrease pain, swelling, and bone loss. There is a small gym in the office where you can work out each day or a larger gym at 4223 State Street. where you can take classes or do your own workout program. Dr. Lawson believes it is very important to look at what you eat as well as what vitamins you take. Over the last 26 years, she has developed a comprehensive nutritional style by working with several nutritional companies, taking classes and reading all the latest research. She has a unique style of not overloading you or your body with information or supplements by giving you just what you need now to balance your body out.